USB 3.1 IP works at SuperSpeedPlus mode at 10 Gbps, SuperSpeed mode at 5 Gbps and all USB 2.0 speed modes . Inno-Logic s USB 3.1 IP can be seamlessly used for integration into SoCs for applications such as Media Storage. Inno-Logic USB 3.1 Device Controller IP offered as a complete solution together with PHY, VIP, software driver and configurable FPGA demo. 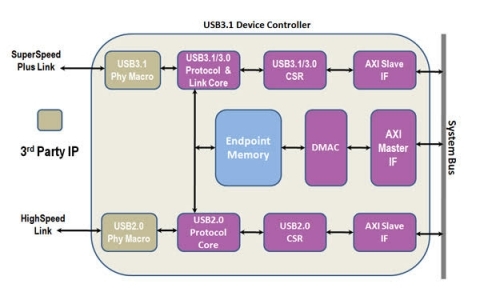 Inno-Logic USB 3.1 Device Controller IP is silicon-proven and shipping in mass production. Supports SuperSpeedPlus (10 Gbps) , SuperSpeed (5 Gbps) and fully backward compatible with USB2.0.